Do you delight in dreaming of a large, well-tended garden in your backyard, but can’t seem to make the time to plan, plant, weed, water, and wrangle fruits and veggies around an already packed schedule? If you aren’t in a position to garden yourself this year, consider letting the professionals at Crabtree do that hard, sweaty, and time consuming work for you. Joining our CSA (Community Supported Agriculture) allows you to reap the benefits of what we sow here at the farm without having to do any of the digging, maintaining, or harvesting yourself. 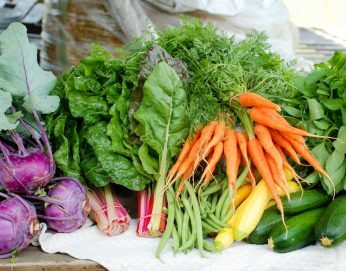 By joining our CSA, you sign up for a season’s worth of fresh, seasonal, and healthy produce while supporting Crabtree’s mission of growing, educating, and connecting. Let us feed you and your loved ones! Our CSA boxes contain many tried and true favorites as well as some fruits & veggies that you may have been curious about but have hesitated to buy on your own due to unfamiliarity or uncertainty about how to prepare them. To that end, we provide our newsletter subscribers with a recipe idea every week to help inspire you. Additionally, with the advent of the ease of looking up recipes online, you now have access to tons of recipe ideas for new-to-you yummies such as kohlrabi or romanesco cauliflower. Lastly, with three pick up locations to choose from (Wednesdays @ Main Street Farmers Market and Saturdays @ either the farm or Brainerd Farmers Market), convenience is at the forefront. We look forward to having you be a part of our CSA family staring in May.